26.2 Quest: S.W.A.T. Trot 5k - How did it go? The S.W.A.T. Trot 5k has just added another "fond" to my memories of running. You are aware, unless this is your first time here, that all my memories of the S.W.A.T. Trot have not been fond. Last years race was a fond memory as it was my daughter Payton's first 5k, but the year before was not quite as fond. I won't bore you with all the details here as I feel like I have said more than enough about it over the last couple years. If you read my kinda blah post on Saturday before the 8:00 pm start time of this race you will know that I didn't have big plans for this race. I had pretty much decided that I would just run it for fun and not try to set any PR or even come close. I had told my neighbors that I would probably run with them.... if they weren't going to fast. My left thigh was not hurting, but was not 100% either and I didn't want to end up pulling it. While we were waiting for the race to start I saw George Southgate. Last year, George helped cheer Payton along to the finish when she was starting to not listen to me any more. I have seen George at different races here and there but had never talked to him before. He would have to tell you for certain, but I think he said he has run over 80 marathons, 30 in the past 30 months! The time came to line up and I jogged over to the start. I ran into Michael Taylor who ran this race last year as well. I didn't meet Michael till after the race. We met online while we were both searching for the results to be posted and getting upset because they were taking so long. We chatted for a couple minutes and then it was time to go. I started off very relaxed to test the thigh out. I also wanted to get past the dreaded "scene of the crime" without experiencing the same joys once again. As we came past the first 100 yards there was my family and all the others out cheering us on. My leg was feeling good so I turned up the pace just a little bit and came up on one of my neighbors. I kept up the pace and soon caught his wife. At that point my leg was feeling solid so I went ahead and turned it up a notch. The first mile came and I was running right at a 7:30 pace. I was still feeling good and continued on what felt like the same pace. As I was nearing the 2 mile mark my watch beeped just a little bit before the marker and read around 7:20. If adjusted to where the actual mile marker was I was still running a very solid 7:30 pace. 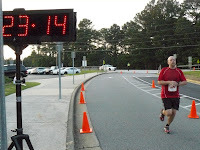 Immediately following the 2 mile mark I was starting to feel it in my breathing so I decided to slow the pace a little. It must not have lasted too long because when I passed the 3 mile mark I was still dead on a 7:30 pace. The final .1 was tough but when the end is in site it is not too hard to finish strong. The finish line came faster than I have ever seen a finish line come before. When I crossed the line the time was 23:14, a PR by 9 seconds, and to make it even more special, my last PR was set over 2 years ago, before the broken collar bone incident. It shows that the fitness is finally starting to come back..... if I could only drop those few extra pesky pounds I put on since then! I am really enjoying my new Pearl Izumi SyncroFuel XC's. This was the first race I ran in these shoes and they are much lighter and more comfortable to run in. I will write more about them in the days to come. The official results are not yet posted, but I know I finished 16th overall and first in my age group. I will post more results once they are posted. My full splits and stats can be found here. If you haven't yet entered to win the free shoes, tech shirt, or goodie bag you have just 2 days left. Make sure you head over and sign up, the odds are really good of winning something! **edit 06/15 - Don McClellan uploaded his photoshow so I had an image to add to the post. He took a pic of me while on the course but it must not have turned out. Tim! I am sooooooo happy for you - a) for your new PR; and b) to discover you're a great narrative writer!!!! As I read your recount of the race, you had my heart pumping harder and I relived it myself!!! 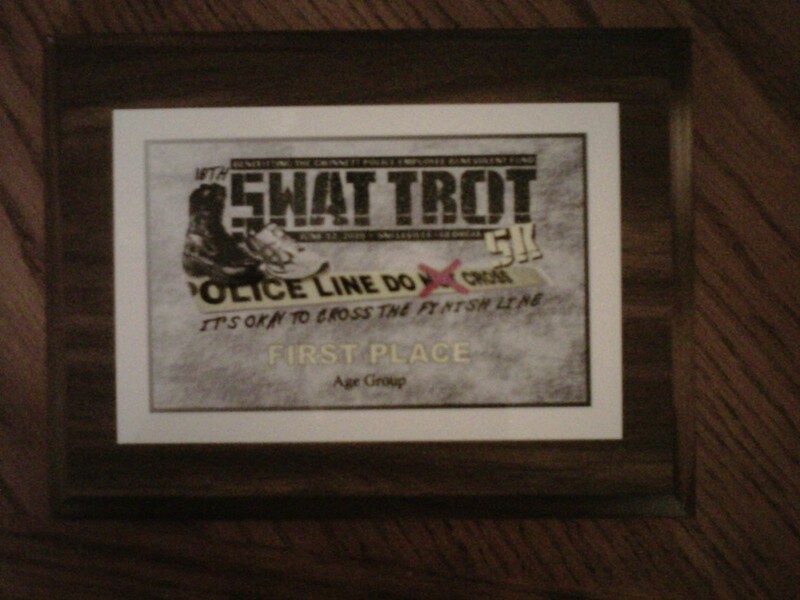 My time was much slower but a victory nonetheless, in that I've gone 6-7 weeks with 5K's over 30 minutes... but last Saturday morning and then for the SWAT Trot, I finished under 30!! In fact, I ran faster Saturday night than Saturday a.m. so maybe I'm on the way back. 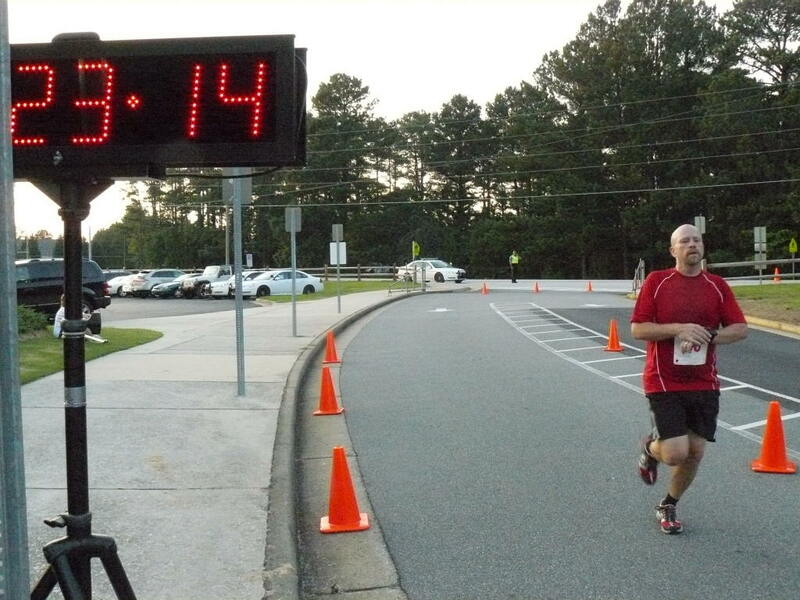 I sat my own PR in Loganville last December 12 @ 24:29 -- so you can see my times are significantly off, and I have a long way to go, and another 10-12 lbs to lose. Congratulations on running a great race and PRing! And first in your age group is awesome! Impressive considering the mindset going in. I think the most important thing is just getting to the start line. Once you are there, then you can see what happens after the gun goes off. Congrats. Way to go! Congratulations on a fantastic if unexpected PR! Thanks everyone for the kind words! I just added another pic to the post. @Mike - I am running the ATC Fathers Day 4 miler this Saturday. After that the Peachtree and then nothing else planned yet. Hi! 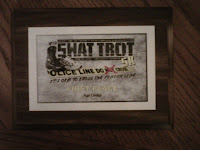 I ran across your blog looking for results for SWAT Trot. I was there. (24:28) It was HOT! And saw you ran Chickamauga! I love that race. (3:40 last year) Anyways, wanted to say great job on your first marathon last November. Just that experience means time off your next one... even before the training.